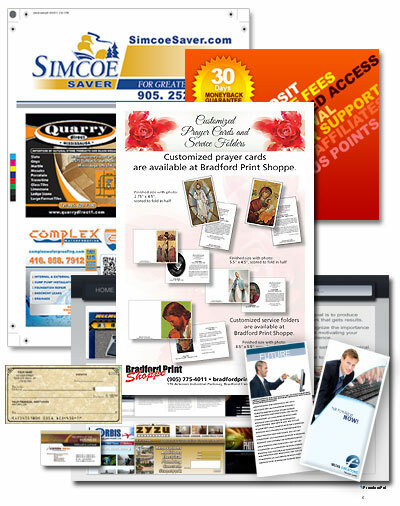 Bradford Print Shoppe, established as a commercial print shop, prints business cards, letterhead, envelopes, NCR invoices, work orders, driver logs, bills of lading, brochures, flyers, and manuals. A variety of binding options are available such as wire binding and cerlox binding. Personalized corporate cheques & deposit books, cheque book covers, and other accessories are available. Other printing jobs include: dance tickets, stag and Jack and Jill tickets, raffle tickets, announcement cards, Baptism and Communion invitations, and wedding invitations.